Reviewed by Lewis Robert Colon Jr. 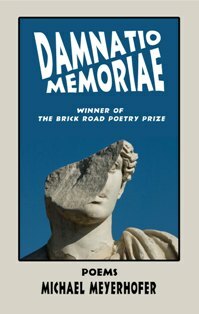 Crack the lid on the melting pot of contemporary poetry and you’ll find no shortage of poets trying to do what Michael Meyerhofer does effortlessly in Damnatio Memoriae, his third full-length book. Many of the poems in the Brick Road Poetry Prize-winning volume are the kind of imaginative feats of cleverness that Amy Gerstler has perfected. This good-natured weaving of tragicomic autobiography, obscure history, and imaginative dives down the what if rabbit hole is the sort of stuff that’s easy to like but not so easy to pull off. cost folks well below the poverty line. bends to drink from a fountain. on any windowsill but mine. It’s all right. It’s all right. It’s all right. Meyerhofer’s poems are like this. They’re two objects at once. “Dedication” seems like an ain’t-it-grand-just-being-alive poem because it is one. At least, that’s where it ends up. The featured player, though, is language and its stickiness. The clause "It's all right" has that personal resonance for the poet that we all have for certain turns of phrase which, when heard, pull us into a Proustian vortex of memory. "Dedication" gives us a tour of the vortex with nonchalance where one might expect wistfulness—the sort of surprising pirouette that typifies the book and the poet. At one hundred pages, Damnatio Memoriae is a kind of grand tour of what it’s like to walk around Earth as a poet in the twenty-first century. The book feels its length, a little, toward the end, but its best moments are satisfying and funny, allowing us to glimpse minor, characteristically male humiliations—the author being told someone’s abusive boyfriend can “take” him in a fight, the author catching a whiff of an attractive woman in a bar who “wants nothing to do with” him—and are drawn into serious poems about a less-than-idyllic childhood and a mother whose death preoccupies the poet, who doesn't dwell on the subject for long. Lewis Robert Colon Jr. lives in Chicago.